When an individual has a stroke or other brain injury that affects the left side of the brain, it may disrupt their ability to use language. Many times, these survivors are diagnosed with aphasia. Your speech-language pathologist or neurologist may classify your loved one's language using one of the terms listed below. Anomic Aphasia: Anomic aphasia is the least severe form. With it, a person is often unable to supply the correct words for the things he/she wants to talk about—objects, people, places, or events. It’s sometimes described as having a word on the tip-of-your-tongue, but you can’t say it. A person diagnosed with anomic aphasia, may have significant difficulties coming up with a specific word to name: objects, people, places, or events. He or she usually understands speech well and is able to read adequately, but writing ability may be poor. Broca’s Aphasia: Broca’s aphasia is also referred to as non-fluent or expressive aphasia. This type of aphasia can be very frustrating, as a person with Broca’s aphasia knows what he or she wants to say, but is unable to accurately produce the correct word or sentence. Expressing language in the form of speech and writing will be severely reduced. The person with Broca’s aphasia may be limited to short “telegraphic” statements, with words like “is” or “the” left out. People who are diagnosed with severe Broca’s aphasia may benefit from a communication device. Mixed Non-fluent Aphasia: Mixed non-fluent aphasia resembles a severe form of Broca’s aphasia because the person’s speech is sparse and laborious. However, unlike Broca’s aphasia, a person with mixed non-fluent aphasia may also have limited understanding of speech and not be able to read or write beyond an elementary level. Wernicke’s Aphasia: Persons diagnosed with Wernicke’s aphasia are unaware that the words they are producing are incorrect and nonsensical. He or she may have severe comprehension difficulties and be unable to grasp the meaning of spoken words, yet may be able to produce fluent and connected speech. Reading and writing are often severely impaired, as well. 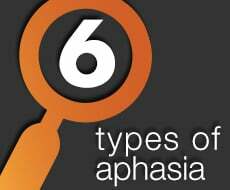 Global Aphasia: Global aphasia, as the name suggests, refers to wide-spread impairment. This is the most severe form of aphasia, and usually occurs immediately after a stroke in patients who have experienced extensive damage to the brain’s language area. A person with global aphasia loses almost all language function and has great difficulty understanding, as well as forming, words and sentences. People who suffer from global aphasia may only be able to produce a few recognizable words, understand little or no spoken speech, and be unable to read or write. Primary Progressive Aphasia: Primary progressive aphasia is a rare degenerative brain and nervous system disorder that causes speaking and language skills to decline over time. A person who becomes symptomatic with primary progressive aphasia may have trouble naming objects or may misuse word endings, verb tenses, conjunctions, and pronouns. Unlike actual aphasia, which is the result of brain damage, primary progressive aphasia is a progressive type of dementia. Categorizing different subtypes of aphasia can be complicated. Aphasia may be classified based upon the location of the lesion, or the patterns of language difficulties; each with varying degrees of influence on an individual’s language skills. It is important to keep in mind that a person’s initial presenting symptoms can change with recovery, and therefore, the classification of the aphasia may change. The good news about aphasia is there is hope. With practice and determination, individuals with aphasia can rebuild their language skills. Lingraphica can help find the right resources for you to improve your language skills. To learn more about aphasia, download our free Aphasia Journey eBook.